We have a formula that works. WE DO OUR HOMEWORK. WE DON’T WASTE TIME. WE HAVE A BLAST. WE GUARANTEE RESULTS. It’s an incredibly exciting time for the life science industry. Today, more than ever, our clients have drug candidates entering late stages of development. We are celebrating the approvals of their innovative drugs and supporting them as they begin to commercialize these products in the market. The life science industry remains complex as access to capital continues to be challenging, global partnering relationships are established, and some companies adopt a virtual model. This fast-paced and ever-changing environment has provided us with an outstanding opportunity to redevelop our From the Laboratory to Leadership program, building off of 25 years of success with over 5,500 graduates from over 550 life science companies. This fully redesigned program continues to turn science-minded first-time managers, as well as managers seeking to expand their management skills, into capable business leaders. We accomplish this by leveraging our extensive industry-specific knowledge and experience to utilize the most progressive and engaging professional development methods available. From the Laboratory to Leadership begins by helping participants assess who they are as leaders – their strengths, styles, and personal brand. From there, we develop skills in the areas of communication, priority management, meeting management, goal setting and planning, delegation, performance management, and leading teams in a dynamic workplace. We wrap up the program in a fashion that brings all the learning together in a fun and impactful way. To drive high levels of engagement and impact, this program integrates learning pods, utilizes technology to measure progress and support a variety of learning styles, encourages participants to use their companies as learning labs, and helps clients set goals that deliver measurable results. It’s an incredibly exciting time for the life science industry. Today, more than ever, our clients have drug candidates entering late stages of development. We are celebrating the approvals of their innovative drugs and supporting them as they begin to commercialize these products in the market. The life science industry remains complex as access to capital continues to be challenging, global partnering relationships are established, and some companies adopt a virtual model. This fast-paced and ever-changing environment has provided us with an outstanding opportunity to redevelop our From the Laboratory to Leadership program, building off of 25 years of success with over 6,000 graduates from over 600 life science companies. This fully redesigned program continues to turn science-minded first-time managers, as well as managers seeking to expand their management skills, into capable business leaders. We accomplish this by leveraging our extensive industry-specific knowledge and experience to utilize the most progressive and engaging professional development methods available. Recommended as the follow-up to From the Laboratory to Leadership, this program takes your experienced managers to the next level by taking a deep dive into visioning and influence skills, thinking strategically, inspiring creativity, creating a culture shift, decision making, problem-solving, and leading in a matrix team structure. Participants will come away with core leadership skills to drive strategic results for your company. Investment: Each session is $795 for CLSA members, $995 for non-members. Receive a 10% discount for registration and payment of three or more sessions and a 15% discount for registration and payment of all six sessions. 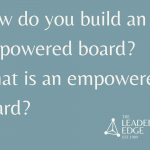 This leadership program is designed to empower the women leaders in your organization to get the EDGE, enabling them to excel within their companies, develop their authentic leadership style, gain support, skills, and tools, and elevate their success. Additional themes include: networking for success, developing an executive presence, leveraging emotional intelligence, and vision as a leadership tool. Our curriculum is customized to the unique culture of each of our clients and is designed to achieve their specific goals. 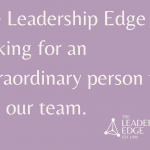 The Leadership Edge develops and strengthens the collective talent of people in purpose-driven life science companies around the world. We accelerate their performance resulting in life-changing discoveries that enhance our daily lives.